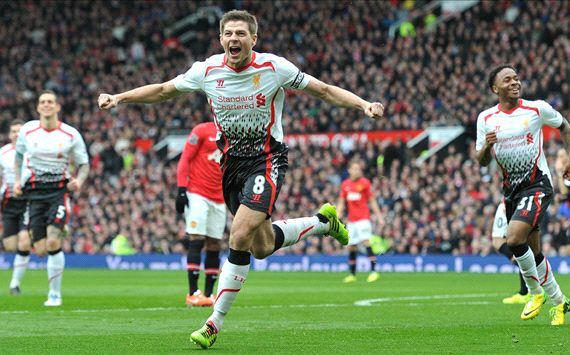 Steven Gerrard scored twice from the spot as Liverpool beat Manchester United 3-0 at Old Trafford on Sunday. The Reds skipper converted his first penalty before the break after Rafael handled Luis Suarez's cross inside the box, before doubling his side's advantage after a Phil Jones foul minutes into the second half. But Gerrard missed the opportunity to become the first ever Premier League player to score a hat-trick of penalty-kicks after Nemanja Vidic was sent off for bringing Daniel Sturridge down in the area. The 33-year-old picked his spot for the third time of the afternoon but hit the post, although Suarez managed to add a third minutes later. The result moves Brendan Rodgers' side up to second in the Premier League table, four points off league-leaders Chelsea. United, by contrast, remain seventh - 14 points off Liverpool.